The 2012 DesignSpark chipKIT Challenge invited engineers from around the world to submit eco-friendly projects using the Digilent chipKIT Max32 development board. Manuel Iglesias Abbatemarco of Venezuela won honorable mention with his autonomous home-automation controller. His design enables users to monitor and control household devices and to log and upload temperature, humidity, and energy-use sensor data to “the cloud” (see Photo 1). Photo 1: The design comprised a Digilent chipKIT board (bottom), my MPPT charger board (chipSOLAR, middle), and my wireless board (chipWIRELESS, top). The system, built around the chipKIT Arduino-compatible board, connects to Abbatemarco’s custom-made “chipSOLAR” board that uses a solar panel and two rechargeable lithium-ion (Li-on) cells to provide continuous power. The board implements a maximum power point tracking (MPPT) charger that deals with a solar panel’s nonlinear output efficiency. 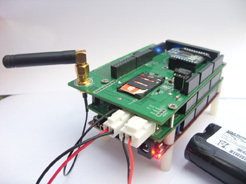 A “chipWIRELESS” board integrating a Quad Band GSM/GPRS modem, an XBee socket, an SD card connector, and a real-time clock and calendar (RTCC) enables home sensor and cloud connectivity. The software was written using chipKIT MPIDE, and the SD card logs the data from sensors. Abbatemarco describes his full project, including his post-contest addition of a web server, in his article appearing in Circuit Cellar’s May issue. In the meantime, you’ll find descriptions of his overall design, power management board, and wireless board in the following article excerpts. The system’s design is based on a Digilent chipKIT Max32 board, which is an Arduino-compatible board with a Microchip Technology 32-bit processor and 3.3-V level I/O with almost the same footprint as an Arduino Mega microcontroller. The platform has all the computational power needed for the application and enough peripherals to add all the required external hardware. I wanted to have a secure and reliable communication channel to connect with the outside world, so I incorporated general packet radio service (GPRS). This enables the device to use a TCP/IP client to connect to web services. It can also use Short Message Service (SMS) to exchange text messages to cellular phones. The device uses a serial port to communicate with the chipKIT board. I didn’t want to deal with cables for the internal-sensor home network, so I decided to make the system wireless. I used XBee modules, as they offer a good compromise between price and development time. Also, if properly configured, they don’t consume too much energy. The XBee device uses a serial port to communicate with the chipKIT board. To make the controller”green,” I designed a power-management board that can work with a solar panel and several regulated DC voltages. I chose a hardware implementation of an MPPT controller because I wanted to make my application as reliable as possible and have more software resources for the home controller task. One board provides power management and the other enables communication, which includes additional hardware such as an SD card, an XBee module, and an RTCC. Note: I included the RTCC since the chipKIT board does not come with a crystal oscillator. I also included a prototyping area, which later proved to be very useful. I was concerned about how users inside a home would interact with the device. The idea of a built-in web server to help configure and interact with the device had not materialized before I submitted the contest entry. This solution is very practical, since you can access the device through its built-in server to configure or download log files while you are on your home network. To make the system eco-friendly, I needed to enable continuous device operation using only a solar panel and a rechargeable Li-ion battery. The system consumes a considerable amount of power, so it needed a charge controller. Its main task was to control the battery-charging process. However, to work properly, it also had to account for the solar panel’s characteristics. A solar panel can’t deliver constant power like a wall DC adapter does. Instead, power varies in a complex way according to atmospheric conditions (e.g., light and temperature). For a given set of operational conditions, there is always a single operating point where the panel delivers its maximum power. The idea is to operate the panel in the maximum power point regardless of the external conditions. I used Linear Technology’s LT3652 MPPT charger IC, which uses an input voltage regulation loop. The chip senses the panel output voltage and maintains it over a value by adjusting the current drawn. A voltage divider network is used to program the setpoint. You must know the output voltage the panel produces when operated at the maximum power point. I couldn’t find the manufacturer’s specification sheet for the solar panel, but the distributor provides some experimental numbers. Because I was in a hurry to meet the contest deadline, I used that information. Based on those tests, the solar panel can produce approximately 8 V at 1.25 A, which is about 10 W of power. I chose 8 V as the panel’s maximum power point voltage. The resistor divider output is connected to the LT3652’s VIN_REG pin. The chip has a 2.7-V reference, which means the charge current is reduced when this pin’s voltage goes below 2.7 V.
I used a two-cell Li-ion battery, but since the LTC3652 works with two, three, and four cells, the same board with different components can be used with a three- or four-cell battery. The LT3652 requires an I/O voltage difference of at least 3.3 V for reliable start-up, and it was clear that the panel’s 8-V nominal output would not be enough. I decided to include a voltage step-up stage in front of the LT3652. I used Linear Technology’s LT3479 DC/DC converter to get the panel output to around 18 V to feed the MPPT controller. This only works if the LT3562’s voltage control loop still takes the VIN_REG reference directly from the panel output. Figures 1 and 2 show the circuit. I could have fed the chipKIT on-board 5-V linear regulator with the battery, but I preferred to include another switching regulator to minimize losses. I used Linear Technology’s LTC3112 DC/DC converter. The only problem was that I needed to be able to combine its output with the chipKIT board’s 5 V, either through the USB port or the DC wall adapter option. The chipKIT board includes a Microchip Technology MCP6001 op-amp in comparator configuration to compare USB voltage against a jack DC input voltage, enabling only one to be the 5-V source at a given time. Something similar was needed, so I included a Linear Technology LTC4411 IC, which is a low-loss replacement ORing diode, to solve the problem. To my knowledge, when I designed the board a battery gauge for two-cell lithium batteries (e.g., a coulomb counter that can indicate accumulated battery charge and discharge) wasn’t available. The available options needed to handle most of the computational things in software, so I decided it was not an option. I included a voltage buffer op-amp to take advantage of the LTC3112’s dedicated analog voltage output, which gives you an estimate of the instantaneous current being drawn. Unfortunately, I wasn’t able to get it to work. So I ended up not using it. Building this board was a challenge, since most components are 0.5-mm pitch with exposed pads underneath. IC manufacturers suggest using a solid inner ground layer for switching regulators, so I designed a four-layer board. If you have soldering experience, you can imagine how hard it is to solder the board using only a hot air gun and a soldering iron. That’s why I decided it was time to experiment with a stencil, solder paste, and a convection oven. I completed the board by using a commercially available kitchen convection oven and manually adjusting the temperature to match the reflow profile since I don’t have a controller (see Photo 2). 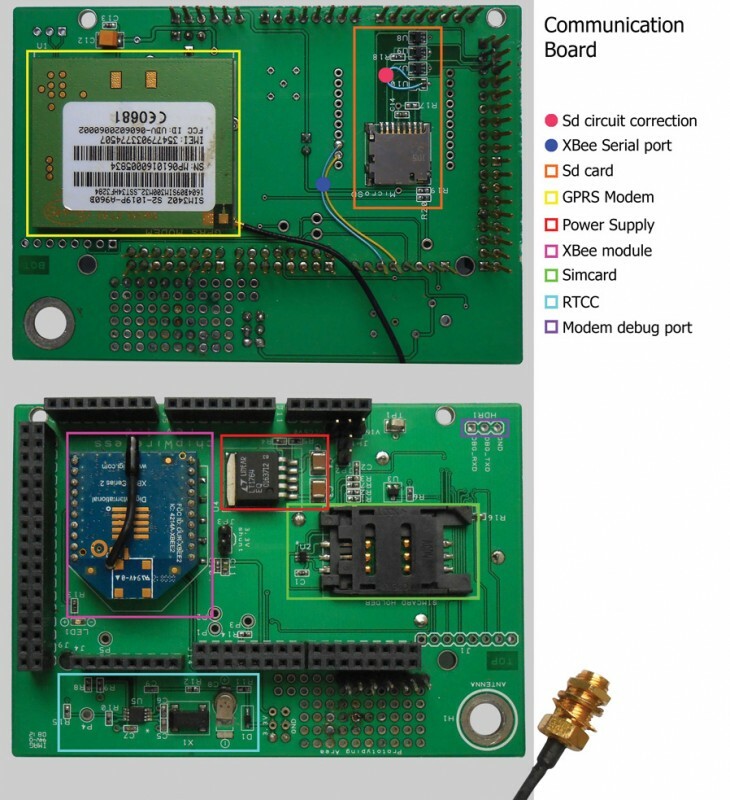 The wireless board has all the components for GPRS communication and the 802.15.4 home network, as well as additional components for the SD file system and the RTCC. Figure 3 shows the circuit. Figure 3: The communication board schematic is shown. At the time of the contest, I used a SIMCom Wireless Solutions SIM340 GPRS modem. The company now offers a replacement, the SIM900B. The only physical differences are the board-to-board connectors, but the variations are so minimal that you can use the same footprint for both connectors. During the contest, I only had the connector for the SIM340 on hand, so I based almost all the firmware on that model. Later, I got the SIM900B connector and modified the firmware. The Project Files include the #if defined clause for SIM900 or SIM340 snippets. A couple of things made me want to test the SIM900B module, among them the Simple Mail Transfer Protocol (SMTP) server functionality and Multimedia Messaging Service (MMS). Ultimately, I discovered that my 32-MB flash memory version of the SIM900B was not suitable for those firmware versions. The 64-MB version of the hardware is required. The subscriber identity module (SIM) card receptacle and associated ESD protection circuitry are located on the upper side of the board. The I/O lines connected to the modem are serial TX, RX, and a power-on signal using a transistor. The chipKIT Max32 board does not have a 32,768-Hz crystal, so Microchip Technology’s PIC32 internal RTCC was not an option. I decided to include Microchip Technology’s MCP79402 RTCC with a super capacitor, mainly for service purposes as the system is already backed up with the lithium battery. I should have placed the SD card slot on the top of the board. That could have saved me some time during the debugging stage, when I have had some problems with SD firmware that corrupts the SD file system. When I designed the board, I was trying to make it compatible with other platforms, so I included level translators for the SD card interface. I made the mistake of placing a level translator at the master input slave output (MISO), which caused a conflict in the bus with other SPI devices. I removed it and wire-wrapped the I/O lines. Another issue with this board was the XBee module’s serial port net routing, but it was nothing that cutting some traces and wire wrap could not fix. Photo 3 shows all the aforementioned details and board component location. Photo 3: This communication board includes several key components to enable wireless communication with sensors,the Internet, and cellular networks. 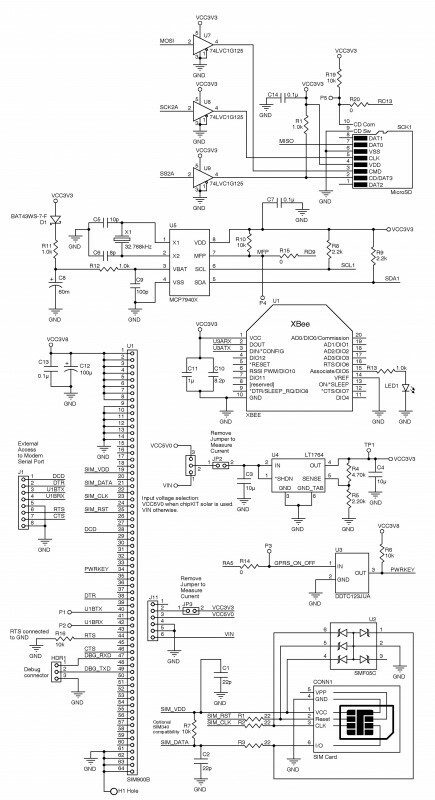 Editor’s Note: Visit here to read about other projects from the 2012 DesignSpark chipKIT Challenge.